Google Analytics is an online-only tracking tool. Google Analytics can track any visit to your website, even if it comes from offline promotions and advertising. As long as your offline advertising triggers someone to visit a website, Google Analytics can track it! You can use Google Analytics offline tracking to measure print, radio or television advertising. You can even track phone calls. Let’s talk about how offline tacking works and how we can set it up. I’m really interested in tracking offline, direct mail and phone calls. Is it possible to get more information on those specifically? Belladonna wants to know how to track her offline direct response advertising. And she wants to learn about call tracking in Google Analytics. Let’s look at how to setup offline tracking using a simple 5 step process. Vanity URLs are custom URLs that are commonly used in marketing material. Vanity URLs are often created for television and radio ads. They are intended to be easy to remember and share. Here’s a vanity URL I created for this tutorial. 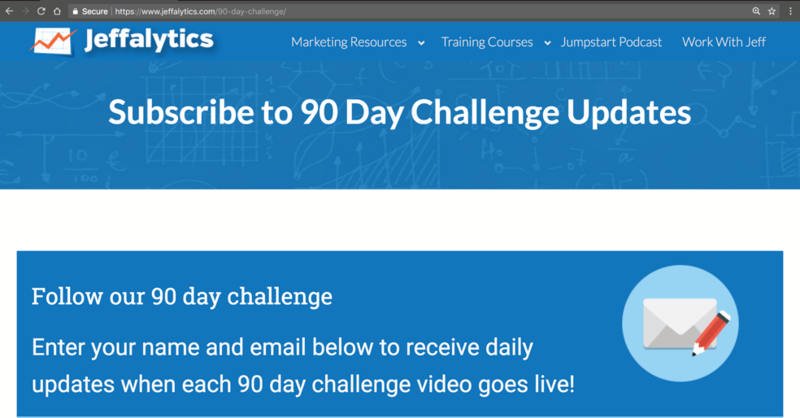 This URL will direct people that want to follow our 90-day challenge videos to a page where they can opt-in to our email list. Your final destination page is where you want your visitors to land when they type in your vanity URL. This page is typically designed around the call to action in your offline promotion. Depending on your ad, you might want users to submit a form, opt-in to an email list, or buy your product. In our example, my final destination is the opt-in page for our 90-day challenge email list. UTM parameters are tags you ad to your URL so you can track your URL in Google Analytics. You can add UTMs to your URLs using Google’s campaign URL builder. In the example below, I’ve built a campaign URL based on a fictional offline ad. Let’s say I want to advertise in the newspaper, right next to the Garfield comics! I don’t know if Garfield comics are still in print. But, he’s the perfect spokescat for our 90-day challenge videos. The web address of your destination page goes in the website URL field of URL builder. The rest of the fields help you identify your campaign so you can find it in your analytics reports. Once you’ve set up your URL parameters, copy your full URL to your clipboard for the next step. You can use a 301 redirect to send traffic from your vanity URL to your final landing page. If you’re not a developer, and you use WordPress, there are a number of plugins that are designed to create redirects. As you can see in my example below, I’m directing traffic from the URL Jeffalytics.com/youtubers to my final URL. Using your Real Time reports, you can verify any hits to your vanity URL and make sure your tracking is working. When testing your tracking, make sure to use an unfiltered view of your Real Time reports. Or test your URL from an IP address you haven’t filtered out of your Google Analytics reports. 1 – Create an easy to remember/type vanity URL for your offline promotions. 2 – Setup a final destination page that people will be directed to when they type in your vanity URL. 3 – Add UTM tracking parameters to your final destination URL so that Google Analytics can track your traffic. 4 – Create a redirect that sends people using your vanity URL to your final destination page. 5 – Check your tracking in your Google Analytics Real Time reports. That’s our five-step process. It’s that easy to setup your Google Analytics offline tracking!! You can track any offline advertising you create a URL for – flyers, mailers, coupons, radio ads, pretty much anything. The second part of our Analytics Course student question was about phone call tracking. Let’s take a quick look at how you can setup Google Analytics call tracking. Setting up your call tracking is also pretty easy. Start by going to the Google Analytics Partners Gallery. Select “Find a Solution.” Then, from the “Solutions Categories” menu choose the option for phone call tracking. 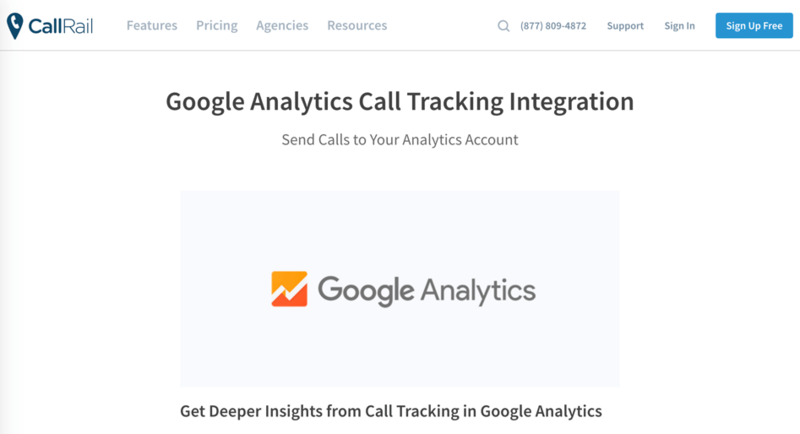 This selection will take you to a list of call tracking apps that integrate with Google Analytics. There are approximately 29 different phone tracking apps to choose from. Select the phone tracking app that fits your needs. Then, follow that app’s instructions for connecting your call tracking to Google Analytics. Will you use Google Analytics offline tracking? What do you think of these offline tracking strategies? Will you use them to track your offline promos? Do you use call tracking? If you do, please share your favorite call tracking app in the comments. This post and video was episode 39 in our 90 Day Challenge digital marketing series.